I thought this was so cute!!! This whole time I've been sort of holding my breath about this whole house thing. Not really talking about it too much and trying to not get too excited. 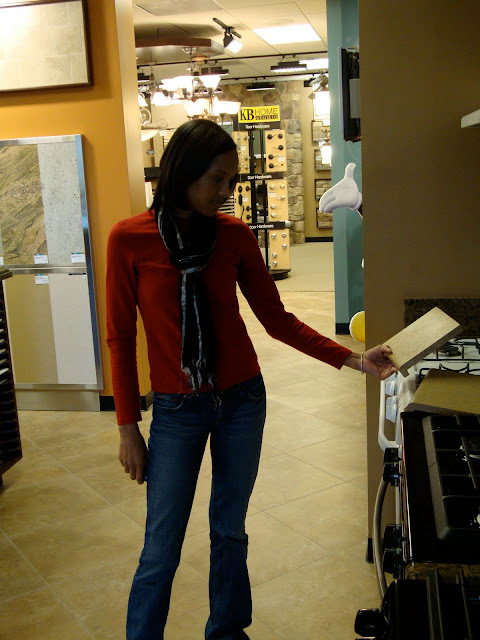 We've been to the design studio to pick out our cabinets, appliances, flooring and other options. We've spent plenty of time pouring over the models. We go by there every week to take pictures of the home building progress and we receive weekly e mails from the builder letting us know what's going on next. We've watched it go from a pile of dirt to an actual frame with steps in it and even ran into a couple of our future neighbors at the sales office. This is a huge and exciting thing yet the fun of it all has been subdued by fear and the house has not ever really felt like ours even after contract signing. First it was the money. Then, when I decided I wanted the house so bad that even though it was above what we originally planned I didn't care. It was still doable and I wanted it. Then, once I got over that it was financing. We got denied our VA loan by the home builder's preferred lender so we immediately went to USAA. We submitted our paperwork two weeks ago and this everlasting limbo has just been going on and on. According to contract we could lose our lot without a lender approval so this was very stressful. You know they don't keep building houses for people who haven't yet figured out how they are going to pay for it. They kept putting our file off behind other ones with closer closing dates instead. Until today. We finally got our answer from USAA and the answer is YES!! Never mind that Mj sent me this evil e mail telling me that we got denied causing my heart to drop into my shoes only to call me a minute later and tell me he was just joking. How mean is that? Let's just say I am really not used to getting what I want. He is the optimist. He hopes for the best and usually gets it. I however hope for the best, but expect [and prepare for] the worst. Once I heard the news I was overjoyed. I was at my desk doing the happy dance with my shoulders. This means that this is really going to happen for us. We are really going to move out of this tiny studio. We are going to be moving into the new house we have been wanting and it WILL be before our wedding. In the not so distant future I will have space to hang my clothes, a garage to park my car and be able to do laundry without stockpiling quarters. Oh, and MJ can finally get all of his stuff out of storage-including the Wii. Maybe I will finally get some exercise!! My parents are also finally going to get some of their garage back when we can go over there and pick up our storage bins they have so kindly stored for us. I want to enjoy this experience at least a little and not just be stressed out by it. I think now that we have made it through this final hurdle I will finally be able to. Next step: lock in our interest rate and decide on points. Then, closing here we come!! I'm a representative from USAA and came across your post. Congratulations on your marriage and on your new home. Please know that we are here for you every step of the way, so don't hesitate to give us a call. I truly apologize for our delay in getting back to you with the loan decision. If there's anything we can help you with, please shoot an email to socialmedia@usaa.com.